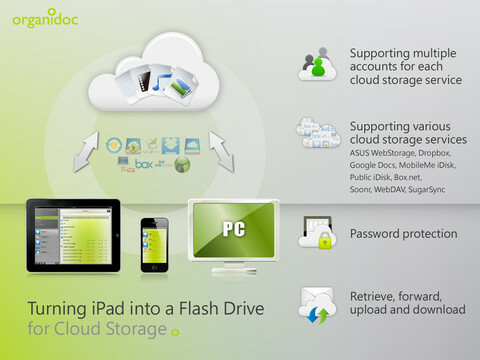 Published by Wenjoy Technology, OrganiDoc HD is your total file management solution for iPad. 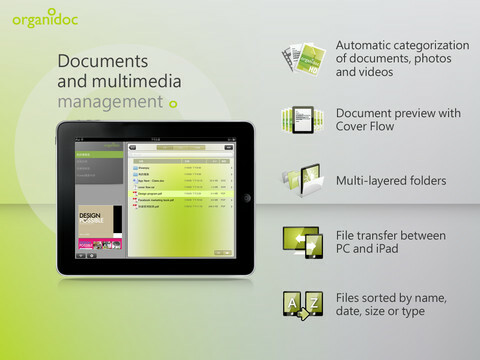 Featuring easy imports for all popular file types, intuitive file browser, cloud storage and some excellent security features, OrganiDoc HD is an iPad app packed with productivity-enhancing features. OrganiDoc HD makes it easy to sync your documents, photos and video to the app through iTunes and then enables you to view the media anywhere you need to. The interface and folder system is smooth, polished and user-friendly. Files are separated by type, making it simple to flick through business docs and then jump to your favorite videos, and cover flow lets you preview files with ease. 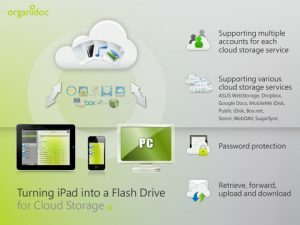 With a multitude of cloud storage options including GoogleDocs, DropBox, MobileMe, Box.net and more, you’ll always have access to your important files on-the-go. OrganiDoc HD also makes sharing easy, with Air Play, Air Print and TV Out providing all the options necessary to present documents, share images or show friends a video clip. Like any good file management application, OrganiDoc HD features password protection and robust security to ensure no-one else can get a hold of your important data. 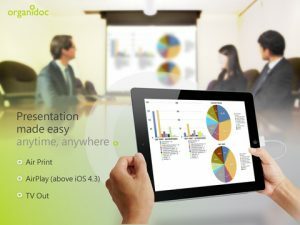 With an excellent portfolio of features and a pricetag of just $4.99, OrganiDoc HD iPad app is a solid investment for the productivity-minded professional. 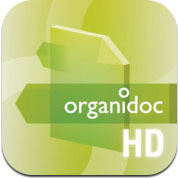 OrganiDoc HD is compatible with iPad. Requires iOS 4.2 or later.